My name is Susan Kistler. I’m AEA’s Executive Director, and I contribute each Saturday’s post to aea365. Today, I thought that I would continue the ‘shortcuts’ theme and tell you about Netvibes. Rad Resource – Netvibes http://www.netvibes.com/en: Netvibes creates a personal internet dashboard. You set up one (or multiple) pages with links to key items that you use online. I’ve set mine up so that I have one dashboard for each of a number of projects. 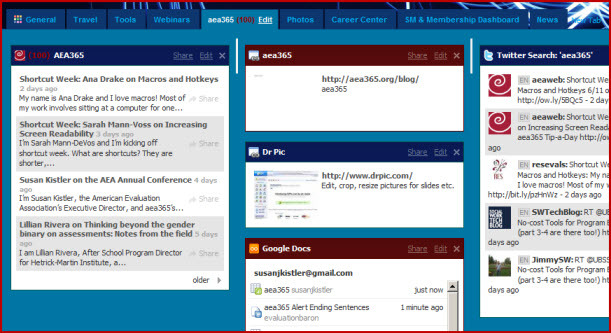 Below, you can find my aea365 dashboard. There, on the left, I have a link to the RSS feed from aea365 that shows the most recent posts (this screenshot was taken earlier this week), in the middle from top to bottom I have a link to aea365 online, to the photo editor that we use, and to the google docs where we track aea365 contributions, on the right is a twitter feed that continuously searches for references to “aea365.” Netvibes is free. Hot Tip – Share a Tab: Here is where Netvibes gets particularly useful. You can set up a tab with all of the widgets/links/resources needed for a project (as long as they are online) and then share that tab with any other NetVibes user who can in a couple of clicks add it to her or his dashboard. Hot Tip – Start by checking out “essential widgets”: When you first go to add content, you’ll discover that there are a LOT of options available – people can make, add, and share their own new widgets. Over on the left, you’ll see an option that says “Essential widgets” start there! Hot Tip – Set up a travel tab: My Netvibes travel tab has sections for flight booking sites, reviews on TripAdvisor, a favorite travel blog, a currency converter, plus news updates related to “travel” and “Anaheim” (keeping an eye on info for the AEA Annual Conference in Anaheim in November!). The above represents my opinion only and not necessarily that of AEA. Do you have questions, concerns, kudos, or content to extend this aea365 contribution? Please add them in the comments section for this post on the aea365 webpage so that we may enrich our community of practice. aea365 is sponsored by the American Evaluation Association and provides a Tip-a-Day by and for evaluators.